Congratulations to senior flute player Andrea Saenz and sophomore flute player Alisa Garcia who have been named to the 2019 TMEA All-Region Mariachi. Congratulations to senior flute player Andrea Saenz and sophomore flute player Alisa Garcia who have been named to the 2019 TMEA All-Region Mariachi. On Saturday, January 26, 2019 students from CSHS competed at the TMEA (Texas Music Educators Association) all-region mariachi auditions in San Antonio Texas. This competition brings students from all across San Antonio and the surrounding areas to compete for a chance to perform in one of the two All-Region ensembles. This marks the first time ever that a student from CSHS is named to the TMEA All-Region Mariachi. 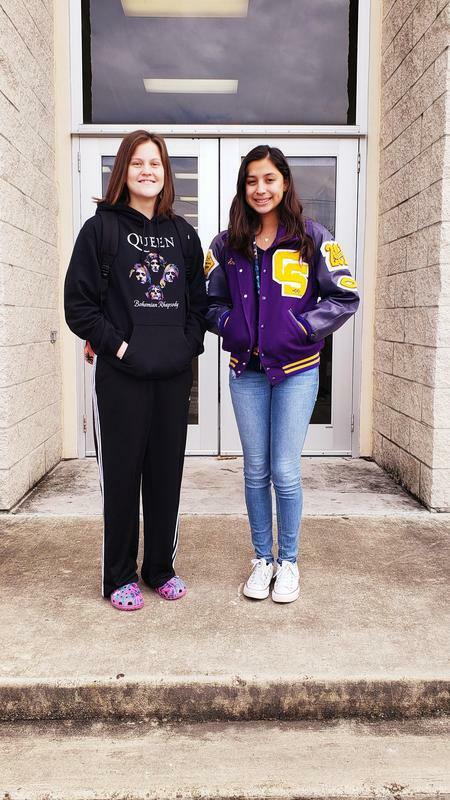 Both Andrea and Alisa will take part in the TMEA Mariachi Concert and Clinic on March 1st and 2nd in San Antonio alongside other students from different schools. They will represent CSHS wearing the brand new purple trajes while other students wear their school outfits. The concert is on March 2nd at Legacy High school in San Antonio. Directors from the CSHS Mariachi are Mr. Ismael Muniz, III and the Director of bands is Mr. Sigifredo Sanchez.